This St. Louis style Clovis point was discovered by Hal Jones in 1978. He found it in his house, lying on a beam above the front porch. The house is located in the northwestern part of the state in Williams Hollow, Alabama. A prior resident of the house, a Mr. Bill Duncan, is believed to have been the original finder of the point. Mr. Duncan had been farming a small field of corn in a nearby creek bottom with a team of mules several years earlier. The picture above shows the side with the longest flute. The arrow marks the end of the flute which measures over 4 inches long. Greg Perino named the St. Louis "fluted" point in 1985. Their primary function would most probably have been for knives rather than spear points. 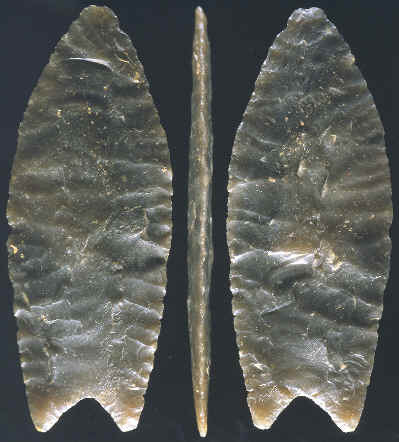 This St. Louis Fluted Clovis point is made of translucent Bangor chert; a material that looks a little similar to Knife River flint. This point measures 5 3/8 inches long and 2 1/16 inches wide. One of the flutes extends almost the entire length of the point and measures 4 5/16 inches long. 1985, "Selected Preforms, Points and Knives of the North American Indians," Vol. 1, by Gregory Perino, p.334. Personal communications with Charley Moore.